For the past 2 weeks, I was a student at the School For Poetic Computation. 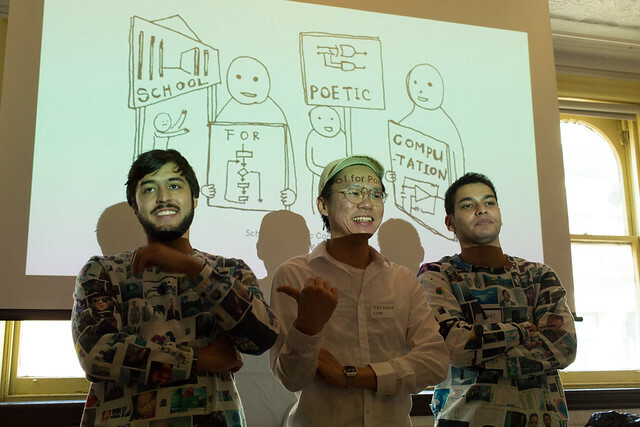 Equal parts artist-organized-school and artist-in-residency, the School was begun as a way for a small group of students and teachers to work together to explore the intersection of contemporary art with code, physical computing, theory and poetics. Classes were held in New York City in the former offices of Kickstarter. Previously held in the fall of 2013 for 10 weeks, this was a compact super-intensive 2 week session for 15 students and 4 teachers, along with guest lectures by a variety of artists, creative coders, theorists, and social hackers. Several years ago, I applied to several traditional MFA programs but ultimately chose not to attend graduate school, wanting to avoid both steep debt and the inflexibility of graduate programs that specialized in a specific sub-niche of art. One of the great things about participating in the School For Poetic Computation was stepping into a community of people that shared my interest in studying the intersections of art and technology and actively working together to experiment, to create art, to have fun with art and code, hardware and computing. Over two weeks we had a huge amount of classes in: OpenFrameworks, building Mesh Networks, Social Automation with APIs, building a 1-bit computer, an intro to Node.js, scraping websites, how to make a living (! ), building physical-digital game controllers, a history of poetry and code, a speculative history of alternative computer history, and lots more. I was impressed with my teachers and fellow learners, and got a lot of energy from what everyone was working on. It was an extremely supportive environment, almost a 21st century Black Mountain College-type experience. Many of my fellow students and I stuck around from 10am until 10pm or later every night as we worked together, ate dumplings, coded, debated, watched youtube videos, talked, taught and soldered long into the night.